Tokyo Tower is one of those attractions that feels like something you <i>have</i> to see while you're in Tokyo. Kind of like the CN Tower in Toronto. But if anyone ever asked me if they should go up the CN Tower, I would roundly object and tell them a myriad of other things they could do instead. Despite being in all the guidebooks about Tokyo, after spending a week in this city and looking back, I think that the tower is something you could probably do with skipping. That being said, we did enjoy ourselves, and when a city this big feels overwhelming, it's an easy option to choose which gives you a unique way of looking seeing the entire city all at once. Tokyo Tower is the world's tallest, self-supported steel tower, standing at 333 meters tall. Tokyo was inspired by the design of the Eiffel Tower in France; it's iconic structure and its power to draw people to it. In 1958, during Japan's economic boom period, they built the tower to help give Tokyo a landmark building which would be recognisable world over. They also needed a higher satellite tower to broadcast all the new television stations that Tokyo was producing. Tokyo was fast developing new technologies, and the construction of such a tower would also help prove their industrial prowess. To date, there have been over 150 million visitors to the tower, so apparently, it worked. When you arrive at the tower, you are greeted by two brotherly mascots named "Noppon". The older of the two is wearing blue overalls and the younger wearing red. They were inaugurated during the 40th anniversary of the tower and can be seen on all the promotional material for the building. They are sweet, and adorably follow you around the tower. On busy days, the line for entry can be pretty long, but on the day we arrived, it was only a few people deep. You have two options for entry, one ticket will take you up the elevator to the main observatory 150 meters up, and the other will take you even higher to the 250-meter upper deck (although this ticket is more expensive). The main observatory offers the best views, informative panels and for anyone who isn't an avid tower climber, there's no need to pay extra to go up those extra 100 meters. You also have the option to climb the 600-step staircase (which you still have to pay to do). We opted to buy the ticket for the main observatory after all that walking, 600 steps up didn't seem like the more relaxing idea. As you ascend in the elevator, you notice the brilliant vermillion colour the tower is painted with stripes of bright white. The orange matches many of the torii gates you'll see across Tokyo, but the reason for painting the tower orange and white is more than just to match those gates. Orange is a warm colour on the spectrum and helps offset cold winter months, while in the summer the cool white helps offset that hot summer heat. Every five years the tower must be repainted, and it takes over 28,000 litres to do so! At night, the tower is light up from below and the lighting changes over the year based on special events and holidays. It has even been known to be lit up for corporate events like the premiere of the Matrix Reloaded and was coloured red and white when Coco-cola launched a new product. Once up top, you have as much time as you'd like to wander around the 360-degree deck. Each section of large windows is complete with a small diagram to show you what historic buildings you can see in the distance. From up high, the Temples and Shrines take on an entirely different appearance. The cemetery gravestones are neatly arranged, like ducks in a row. Parks, otherwise hidden, jump out like gemstones, and everyone people walking along the streets look like birds in the sky. In the main observatory, there are a few sections of flooring called "lookdown windows". They are pieces of clear, thick glass where you can stand and see right down to the ground below. I've stood on a few of these during my travels, and this one was crystal clear, a lot of them get filthy and then blurry, and the effect isn't as impactful, but here, it gives you the chills. One of the most interesting things to see in the tower is the "Mystery Ball". The mystery ball was discovered 306 meters atop the tower when a worker was sent up there for repairs. The ball appeared to be a rubber-ball that children use to play baseball and decades old. After years of weather, the white surface changed to an eroded shade of grey, with holes throughout, making it look extraterrestrial. No one knows how the ball got up there, but the discovery of it has lead to much speculation. Most believable, a worker put it up there, when the tower was first built, as a joke, but people have come up with all kinds of crazy ideas as to how it got up there. Also up on the deck is the Great Shinto Shrine of the Tower. People come here to pray for love and success at school. Students preparing for their exams will make the trek up the stairs to pray. The shrine is considered unique since it's located in the highest place in Tokyo. The shop next to the shrine sells good luck charms and ema plaques in the shape of the mascots to leave at the shrine. After walking around the deck for a bit, we sat down to have a bite to eat in the small cafe. Here you could buy all sorts of refreshments and desserts with that exceptional Japanese flare. We decided on sharing a mango parfait while looking out over the city. Before leaving, we took a walk through "Foot Town" which consists of various shops, cafes and restaurants. In here you can find plenty of Omiyage. Omiyage is an exclusively Japanese type of souvenir, usually edible, which people bring back home. The treats are usually all individually wrapped, and although might only be a small cookie, they are beautifully designed and decorated. You could even find cookies in the shape of Tokyo Tower here to bring back to your friends and family. 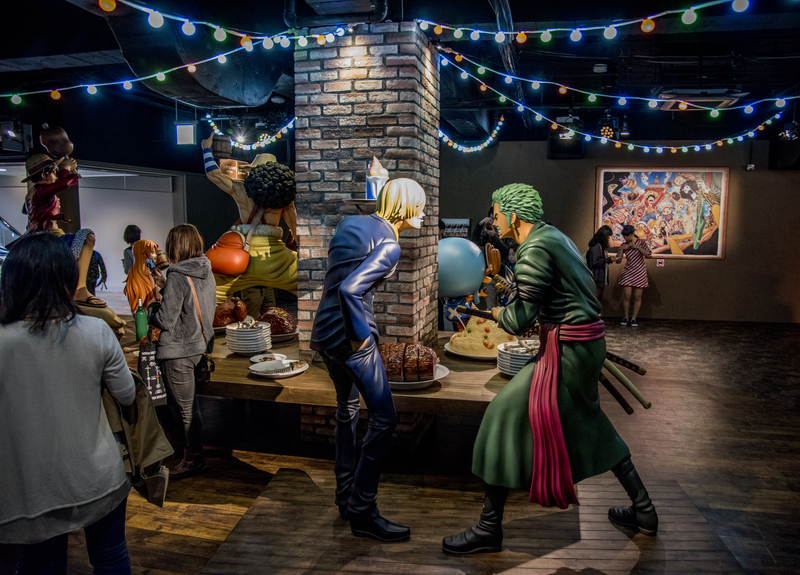 In addition to the Tokyo Tower, you can also buy a ticket which gives you admission to "One Piece Tower", an amusement park based off a popular manga, of the same name, which opened in 2015. The park offers a variety of shows, games and other attractions that feature characters from the series. All in all, we had a splendid time, but if you're only in Tokyo for a short visit, I would say there are plenty more places and things to do that are more worth your time. But if you're looking for a way to see the city and how immense it is, the tower is the perfect place to go.